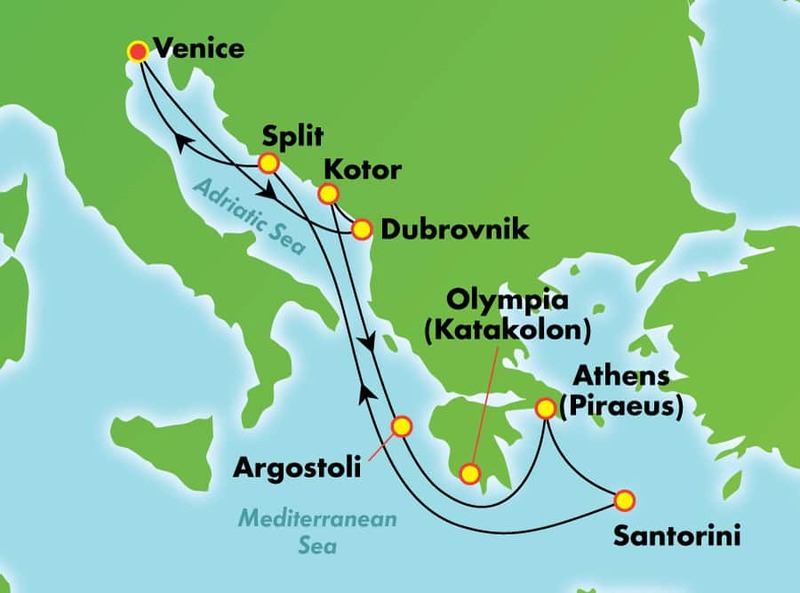 Marvel at the ancient history and natural splendors of Greece and the Adriatic on this amazing roundtrip cruise from Venice. Choose daily trips, tours, and relaxation by the pool. Plan on joining us in the evening at our table for dinner, toasts, and conversation! 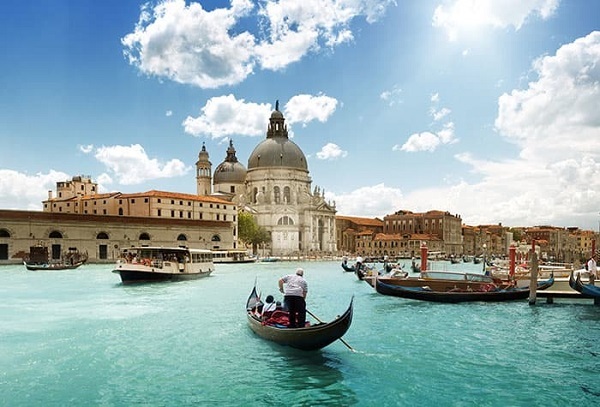 Before you go, make your way along the Grand Canal via gondola and behold the gothic architecture of the Doge's Palace. Whilst in Athens, witness the one-and-only Acropolis, a citadel more than 2,500 years old and still a fixture of the city's skyline. And amble the massive palace in Old Town Split, built by the emperor Diocletian in 4th century ADVERT and today serves as a lively hub for shopping, dining and nightlife. 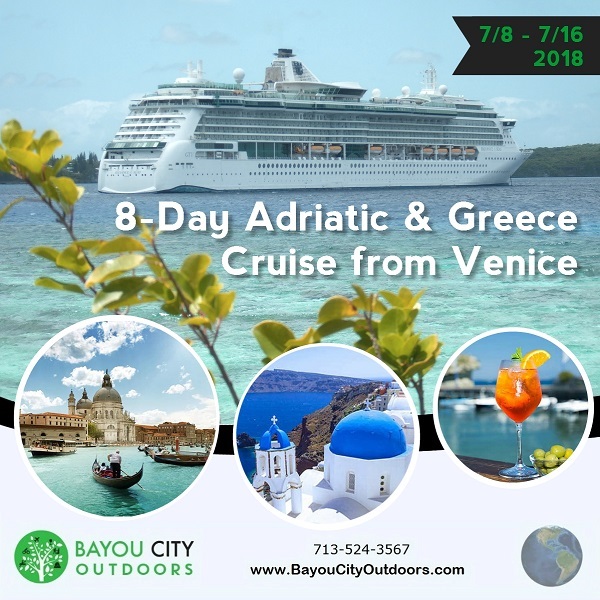 This Mediterranean city on the eastern shores of the Adriatic has a long and eventful history dating back to the awesome Diocletian's Palace (circa 295 A.D.) in the centre of the city. Split offers cruise guests a wealth of exciting places to visit, from the majestic cathedral and marble streets in the centre of town to the harbour area with its caf-lined promenades and views of coastal mountains. Norwegian Star blends the relaxed Freestyle Cruising concept with cruises to the The Caribbean, Europe, and Transatlantic. Onboard Norwegian Star features 15 delicious dining options, 11 bars and lounges, a sprawling spa, an always-exciting casino, plus tonnes of fun for kids of every age. So whether you're exploring Europe sipping Piña Coladas in The Caribbean, or cruising across the Atlantic, this ship offers it all. World-Class Spa - Revive, refresh and recharge in the Mandara Spa®. Let our pampering professionals soothe and rejuvenate you with facials, massages, acupuncture and more. Our full menu of services will leave you feeling like a million! Mix it Up with 10 Bars & Lounges - Norwegian Star feature up to 10 bars and lounges, each with its own unique vibe. Gather at Gatsby's Champagne Bar for a sunset toast or try the international selection of beers at the outdoor Bier Garten. Dining - Serving a wide variety of culinary delights to please every palate, our complimentary dining options include two main dining rooms, a help-yourself buffet and a variety of casual cafés, grills and on-the-go choices. Plus, our Main Dining Rooms offer a menu that changes daily, Chef's Signature Dishes and carefully selected wine recommendations, guaranteeing a different culinary adventure with every visit. Speciality dining - Enjoy a night of gastronomic proportions at one of our many speciality restaurants. Sip your favourite cocktail as you select from choice cuts of Angus beef at Cagney's Steakhouse. Enjoy delicious pasta made with the freshest ingredients inside our rustic and chic Italian eatery, La Cucina. Or savour French cuisine at Le Bistro. No matter what you choose, our speciality dining options feature the tastes you'll crave. Bars and Lounges - With so many bars and lounges to discover, finding your favourite may take a few days. Pop some bubbly and toast to the good life inside Gatsby's Champagne Bar. Kick back with a cocktail then dance it out at Spinnaker Lounge. Or work on perfecting your tan as you relax poolside at Topsiders Bar. Whether you're looking to meet up with friends or make new ones, there's always an opportunity to mix it up. Entertainment - When it comes to the entertainment on Norwegian Star, there's never a dull moment. Tickle your funny bone with the hilarious musings of The Second City, Chicago's legendary improv comedy group. Find out whodunit during our Presumed Murder Luncheon. Or enjoy an evening of knee-slapping laughter alongside stand up comics and unicycle-riding jugglers inside Stardust Theatre. It's showtime. All the time. Activities - From top to bottom and from bow to stern, Norwegian Star ships have enough onboard activities to fill every minute of your cruise. Indulge in a refreshing swim, cocktail or ice cream treat at The Oasis Pool. Wanna get lucky? Bet it all at our award-winning Casinos at Sea®. And when all is said and done, enjoy a pamper session at Mandara Spa. With so much to do, we'll always have you coming back for more. SPA - When you want some "me" time, look no further than Mandara Spa®. Relax with a hot-stone massage, one of over 50 speciality treatments offered. At our onboard spas, treatments range from the classic to the luxurious. Let our pampering professionals soothe and rejuvenate you with facials, massages, acupuncture and a full menu of services. Onboard shopping - Forget to pack something? No worries! Our gift shops onboard carry everything you'll need for fun in the sun. Shop from a variety of souvenirs, cosmetics, clothing, snacks and sundry items. Treat yourself at our duty-free shops full of fantastic savings on fine jewellery, accessories, perfume, liquor and tobacco. Trip Cost: Starting from $1,549 USD Avg. per person.